You are currently browsing articles tagged sherry. This blog rarely discusses mermaids, but that is changing right now. Somehow, as a native English speaker, I think of mermaids and sirens as two different sea creatures. Mermaids being the really hot, friendly companions of sailors too-long at sea that likely originated from manatees. Sirens are the mythological Greek creatures with beautiful, intoxicating voices but hideous phases that caused Odysseus to lash himself to the mast rather than being sucked into crashing his boat on the two rocks that acropophiles will probably know the names of. In Spanish, there’s one word for mermaids and sirens – las sirenas – and apparently the connotation is more of the ancient Greek connotation, but with some kind of latter-day comely sea maiden overlay. Basically, it’s a lot of overlapping meanings, histories, sounds and sights layered onto a single word. Pretty fascinating how some words have that depth of meaning where they encompass 1+ words of another language. Anyway, listening to an ambulance shriek by recently, it struck me that this ambulance “siren” probably comes from the original Greek “siren” of the mermaid/sirena type. Never really thought about how those words overlap but it’s one of those connections that seems so obvious in retrospect that it’s incredible it’s taken 30+ years to make that connection. The same thing happened with this wine. Pedro Ximenez is a hugely undervalued wine that I think makes consistently great (and crazy sweet!) dessert wines from all over the world. I’ve seen them in Spain, Peru, the Canary Islands, Australia and California and looks like Argentina and Chile grow it too. It’s no secret among the cohort of friends that sherry is a style the Selenhos adore and the rest of us are unsold on (most of the group) or generally regard with suspicion (me). Fascinating story on the solera and pretty awesome how palo cortado is made, and there is tons of history layered up on sherry, but it’s still a big gamble when ordering it. And, unless I’m with a connoisseur like Selenho, it’s unlikely a bottle will be ordered for my table. Fortunately, for this story, the Selenhos insisted and we ordered the bottle you see above. Sidebar – pretty amazing typewriter ring in the photo courtesy of Selenhos. Circling back to the sirena-ambulance connection, this bottle of what I thought was sherry is made from Pedro Ximenez grapes. Thinking sherry, I checked out what Montila-Moriles DO, which turns out to be close to Jerez (land of sherry) but actually separate. Montila-Moriles makes its wines in the same stunning solera system of Jerez (google it – seriously), but the wines from Montila-Moriles are not fortified, unlike their names from the south. 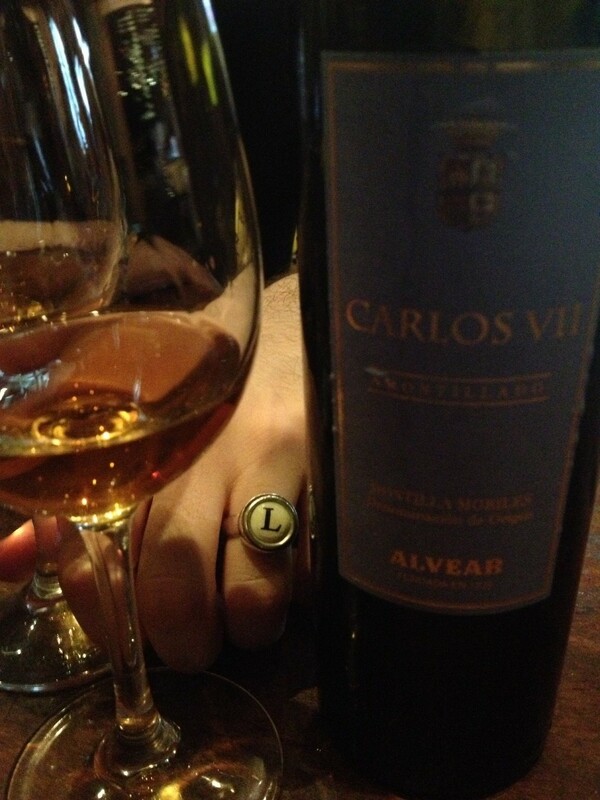 The wine itself is Alvear “Carlos VII” Amontillado Montilla Moriles DO NV, a name hard to remember even for those used to weird-sounding names from Spain. The key bit of that long name though is Amontillado. Amontillado is a style of sherry in the middle – darker than the lighest style (Fino) and not as dark as Oloroso (the dark, sweet style I prefer). It starts life as a Fino but somehow the yeast protector that usually allows Finos to deliver dies (or is killed off) and the winemaker generally fortifies the wine up in alcohol to keep it from turning too bitter (oxidizing too quickly in wine-speak). That’s the sherry style of Amontillado in a nutshell. Cue the ambulance and have a good look at the word “Amontillado.” Looks pretty similar to Montilla-Moriles DO, right? Bingo – apparently, that’s where this style of sherry originated. So even though I was dead wrong about this Amontillado bottle being a sherry now that we know it’s from Cordoba a bit north of Jerez, there’s a pretty strong linkage between these two regions and styles. And the next time I pull out Edgar Allen Poe’s creepy short story on Amontillado and basement terror, it will be thinking of mermaids, ambulances and Montilla-Moriles. I don’t recall exactly as it was quite a long time ago but The Wine Advocate description struck me as the most accurate of the 3 descriptions on this website dedicated to this particular wine (copying the description below). I remember sharp smells and earthy taste, really good with the more biting or pungent food and only ok with the blander foods. Lots of nuts too, especially almonds, which again threw me onto the sherry trail. * Pedro Ximenez (the grape) meet Pedro Ximenez (the wine). Apparently the wine is a dessert wine made from raisins, a fairly labor-intensive process from the sound of it. Sounds kind of similar to how dessert wines are made in Italy (Vin Santo) and Cyprus (Commandaria) with laying out the grapes in the sun so they shrivel up before being pressed. Palomino is one of the three grapes used to make Sherry, a dessert wine from southern Spain that’s known for being nutty. Not a poor pun, it actually tastes like nuts. Palomino is the grape that the Spaniards use when they’re making the less sweet styles of Sherry. Otherwise they go with Ximenez or Moscatel grapes, which produce really sweet dessert wines. Interestingly enough, the sherry that I happened upon has its own frothy, freudian history. “Palo cortado” shown above on that rather blah label means its a wine that started off its aging process as a dry wine but then loses its flor veil (seriously, click that link) and keeps aging as a sweeter style of wine (“From Fino to Oloroso” – Palo Cortado’s memoirs). The result is a wine with the best of both the sweet and the dry. I prefer to think of it as one outstanding gender-bending Spanish citizen. 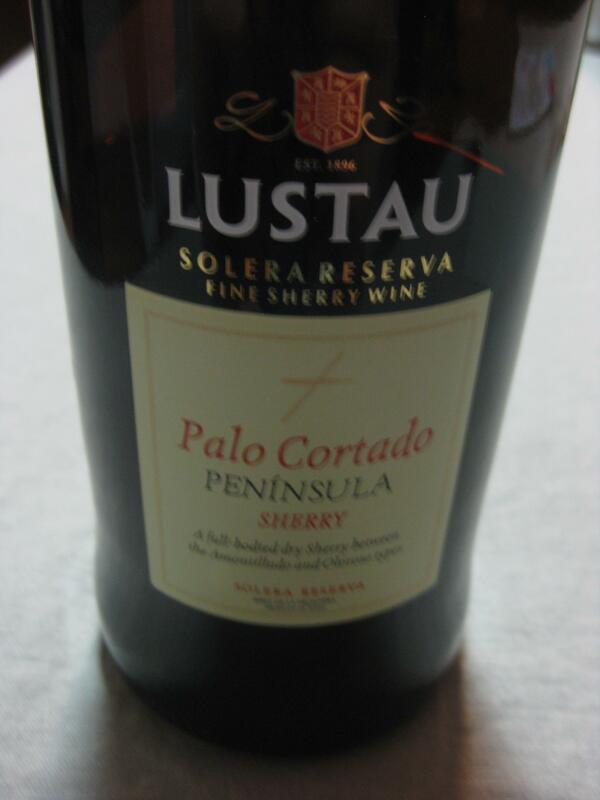 And with the translation of “Palo Cortado” literally meaning “cut stick,” you’d think Freud would have come up with the term “Palo Cortado.” You’d be wrong – it’s an even better story. Sherry’s never really been my thing. It’s always been on the more bitter side and nuts are fine and all but give me candied fruit, dried fruit or some kind of big whiff nose, and I’m much happier than if you shove a bowl of peanuts my way. This wine though is causing me to take a second look at Sherry. Why? Cheese, namely Old Amsterdam Gouda, the best thing that Holland has produced since it exported my great-grandparents (modestia a parte). Really, if you have to have one cheese after dinner, this is the cheese you want. Maybe it was the fish for dinner that didn’t fill the gullet. Maybe it was the liquor cabinet bursting with too many random bottles. Maybe it was fate. This gender-bending Sherry and that udderly divine dutch gouda just destroyed my previous best pairing (pizza and Modern Family) by 5,280 feet. They even did a little dutch spanish dance in my mouth, wooden shoes and bullfighter jabs included. The Gouda provided all kinds of salt and crunchy deposits with a mouth-filling creamy taste. The Sherry added in its own hook-nosed bitterness and cartloads of almonds. So thank you Palo Cortado and Gouda – you just reopened the world of Sherry to one who thought it beyond surprises. Palo Cortado, you rock. * Palomino’s really only used for dessert wines – Spain mostly, but South Africa and California too. * As much as I slander sherry, that solera process deserves its cool points.